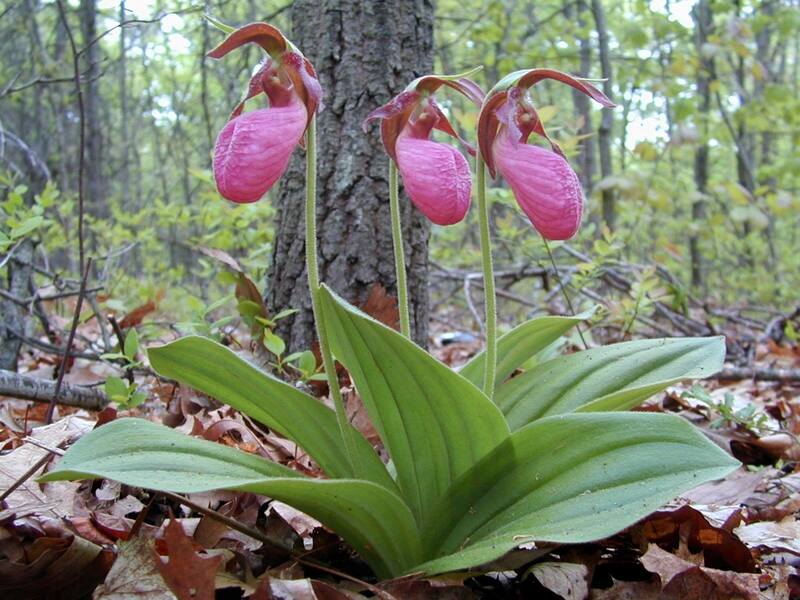 Cypripedium acaule. Dave Taft. facebook (Accessed 1/15.2016). Cypripedium acaule is a perennial monocotyledon, flowering stem 20-40 cm tall, from a rhizome with clusters of fibrous roots (Rook 2004). Leaves basal, elliptic, usually 2, pleated by parallel, impressed veins, 10-20 cm long, 8-15 cm wide, dull green, sparsely hairy, pale below. Cypripedium acaule flower close-up. 2005 © Peter M. Dziuk. Minnesota Wildflowers. minnesotawildflowers.info (Accessed 2/2018). Flowers bright pink, bilaterally symmetrical, fused lower petals (lip) 3-6 cm long, bag-shaped, with a deep cleft along front; 3 sepals and 2 lateral petals yellowish or brownish green, lance-shaped 3-5 cm long, blooms May-June; pollinated by bumblebees (Bombus spp.). 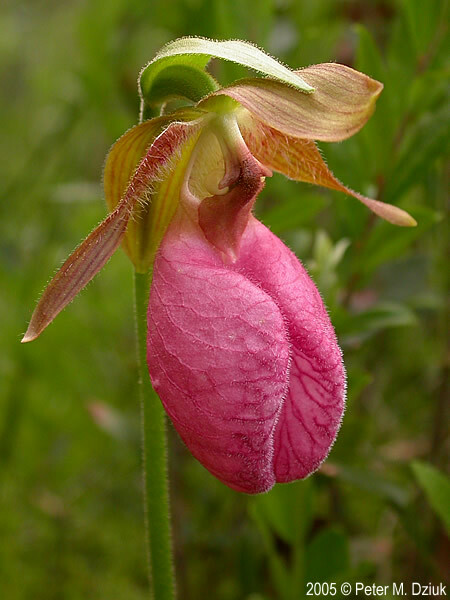 Flowers contain no nectar reward but bee becomes trapped inside flower and must escape by a route that brushes by the stigma, then the pollen masses (pollinia), experienced bees do not visit Cypripedium flowers so few fruits are formed (Rook 2004). Cypripedium acaule developing fruit. 2004 © Peter M. Dziuk. Minnesota Wildflowers. minnesotawildflowers.info (Accessed 2/2018). Fruit becoming dry, a cylindrical pod, infrequently produced, seeds very numerous, dust-like. Habitat: Undisturbed, older moist to dry forests, in acid soil, pH 4-5 (Rook 2004). Shade tolerant. Tending to grow along trail edges. Notes: All orchids are obligate symbionts with particular fungi that differ from other mycorrhizas. As seedlings, orchids do not carry out photosynthesis and are completely dependent upon their mycorrhizal fungi for a supply of carbohydrates. The fungi associated with orchids are mostly (or all) Basidiomycotina and many are wood rotting fungi or pathogens of other plants. Diseases such as damping off, root lesions and seedling stem canker are caused by various species of Rhizoctonia, a genus of soil fungi often forming orchid mycorrhizal associations Rhizoctonia sp., are apparently the sterile stages of a number of genera of basidiospore forming stage fungi including species of; Thanatephorus (Corticium), Ceratobasidium, Ypsilonidium, Sebacina and Tulasnella. An orchid may also form associations with different fungi (often more than one simultaneously) as a seedling and as an adult. 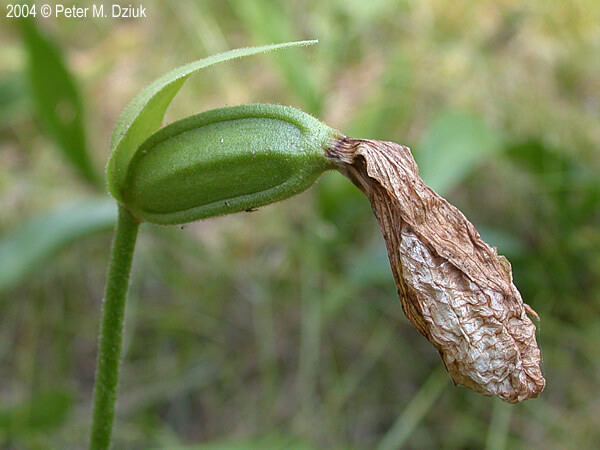 Once an orchid seed germinates it must become associated with an appropriate fungal species in order to grow. The colonization process, at least as studied in culture, is rather dramatic as it may result in formation of mycorrhizas, or infection of the embryo resulting in its death. The embryonic orchid may also resist infection but not form mycorrhizas. Orchids are able to resist and control fungal infections by means of various chemicals (phytoalexins) they produce in response to the fungus (Harborne 1988). Once mycorrhizas are formed, the seedling starts to grow rapidly as it gains carbohydrates from the fungal hyphae. Hyphae of wood rotting or pathogenic fungi have access to an abundant supply of insoluble carbohydrates in the form of cellulose. No evidence has been found that the photosynthetic stage of the orchid supplies carbohydrate to the mycorrhizal fungus, but there is evidence that mycorrhizas supply nitrogen and phosphorus to photosynthetically active orchids. Many tropical orchids do well under cultivation without mycorrhizas but cannot be transplanted back into the wild. None of our temperate, terrestrial Orchids can be transplanted or restored to the wild, although some growers claim to be able to raise them under carefully controlled conditions. A good deal of experimental work has been done with Goodyera repens, a native of New York State, not found in NYC. Habitat protection is the only way to preserve native orchids (Agrios 1988; Lincoff 1981; Smith and Read 1997).